Well it has been a long time since I updated this site, so I have quite a lot to catch up on. 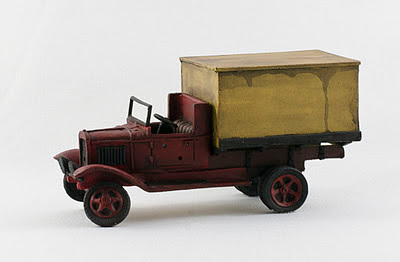 First, a resin and white metal panel board truck I picked up a while back at Imperial Hobbies. The model is decent enough once it has been painted. 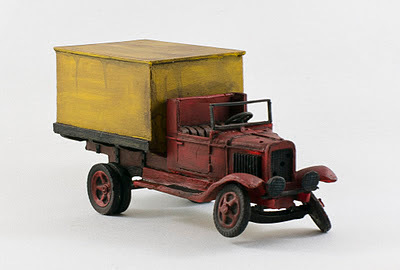 I was going for a wrecked and abandoned truck to have on the street where my tiny little men are fighting, so I bent the front axle and added some bullet holes. I don't know what company made the model, but it came in a plain white box with a photo of the finished truck on the top. The casting quality was adequate, though nothing special. The model itself suffers from some warping, so that the box on the back doesn't really sit straight on the bottom, but because I'm just using it as a wreck, it's no big deal for me.